On behalf of the HfS analyst team and global community, I am delighted to announce our flagship FORA summit taking place this coming March 7th and 8th at Convene, Times Square, Manhattan, New York City. This will span the entire two days with the theme "Learning to Change" dominating the conversation. The tech is here and is being proven, but are we really, truly ready to disrupt our underlying corporate DNA to exploit it to its full potential? Can we really change how we operate, think, collaborate and focus to embrace the new wave of data-driven transformation that is engulfing us? Intelligent Automation in Practice (not theory); Blockchain demystified; Emerging Sourcing Models and the Digital OneOffice; The Emergence of the Chief Data Officer; Making Change Management actually work. HfS analysts spanning emerging technologies, industries and sourcing solutions. The worlds of software providers, business operations leaders, and services providers have always been chasms apart – different mindsets, vernaculars, conversations, ideas of what constitutes value – and vastly different cultures. At FORA, we are bringing together these diverse groups of people to rethink completely how we run global operations in this robotically digital era, to debate the challenges and opportunities posed by automation, AI, analytics, blockchain, global talent on our business operations and our careers. A genuine “digital” organization has the ability to take all the cool social, mobile and interactive tech we use in our personal lives and create that experience for all the people in its environment - its employees, customers, and partners – and empower them to interact with each other seamlessly, and in real-time. The outcome is all about creating, supporting and sustaining an immersive customer experience, where all touchpoints across an organization are tied to serving the customer as effortlessly and seamlessly as possible (and often not necessitating any actual human to human interaction). These “immersive” customer experiences are about leveraging these omnichannels (typically mobile, social, interactive technologies) and creating meaningful analytics from these converged datasets that make this real-time digital experience happen for the organization and its customers, its employees and its partners, right up and down the supply chain. The OneOffice organization needs a support function to service those customers, get its products/services to market when they want them, manage the financial metrics, understand their needs and future demands and make sure it has the talent which truly understands how to meet the desired outcomes of their work. Design Thinking offers an approach for a diverse group of people to work together to identify and articulate a common problem, brainstorm ideas for addressing it, quickly prototype/wireframe/storyboard and test it, and continue to iterate on the idea as it takes shape into a proposed solution. A Design Thinking led approach to designing a Digital OneOffice framework moves the focus of the operations executive and service provider partner away from the process itself, and the internal, “what’s wrong inside of what we do” to “what do we actually want to achieve” (the business outcome), and what do we want people to feel and do naturally that will lead to further engagement and new—and different—results. At HfS, we are finding that Design Thinking is actually changing the way many clients and service providers work, that there is a real complement between designers, consultants, engineers, and service delivery as organizations seek to bring the front, middle and back offices closer together to achieve common outcomes. Moreover, it’s vital that Design Thinking is firmly embedded as the method for ongoing engagement across all organizational stakeholders, as outcomes constantly evolve as markets evolve and business needs change. Every siloed dataset restricts the analytics insight that makes process owners strategic contributors to the business. You can’t create value or transform a business operation without converged, real-time data. 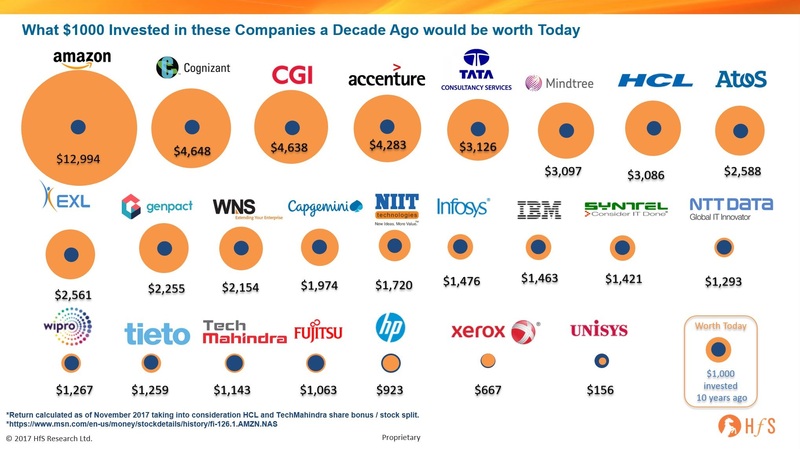 Digitally-driven organizations must create a Digital Underbelly to support the front office by automating manual processes, digitizing manual documents to create converged datasets, and embraces the cloud in a way that enables genuine scalability and security for a digital organization. 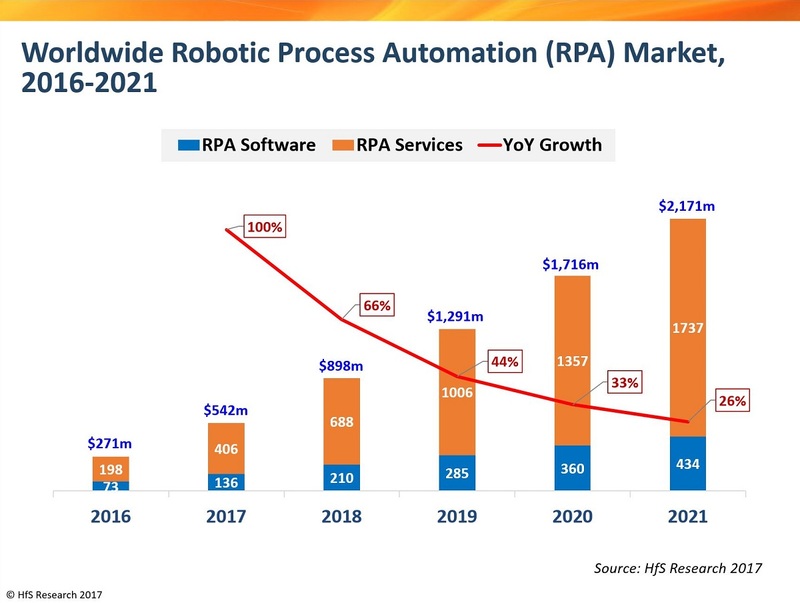 Organizations simply cannot be effective with a digital strategy without automating processes intelligently - forget all the hype around robotics and jobs going away, this is about making processes run digitally so smart organizations can grow their digital businesses and create new work and opportunities. This is akin to a “central nervous system” that incepts and processes all the elements necessary to make the organization function. Enterprises need their support functions such as IT, finance, HR and supply chain, aligned with supporting the customer experience, as opposed to operating in a “vacuum”. We are terming this ”Intelligent Digital Support,” where broader roles are created and human performance is aligned with the achievement of common business outcomes. 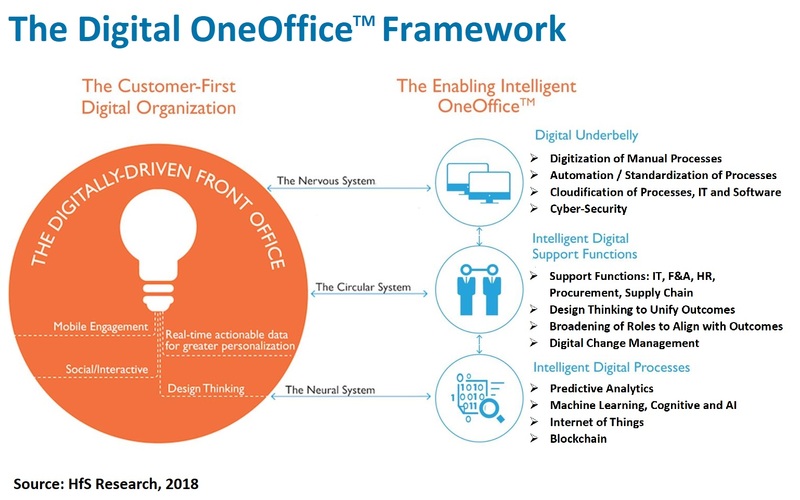 With the Digital OneOffice, the focus needs to shift towards creating a work culture where individuals are encouraged to spend more time interpreting data, understanding the needs of the front end of the business and ensuring the support functions keep pace with the front office. This is especially the case in industries that are more dependent than ever on real-time data, using multiple channels to reach their customers and being able to think out-of-the-box to get ahead of disruptive business models. Progressive OneOffice enterprises prefer flat structures, where staff naturally collaborate in autonomous, cross-functional teams motivated by shared outcomes. They look towards much more dynamic management, where managers and staff constantly interact to fine-tune performance against evolving outcomes and manage diverse workforces across global cultures. The Digital OneOffice is not about collecting and archiving historical data simply to discover what went wrong, it's about being able to predict when things will go wrong and devising smart strategies to get ahead of them. The Digital OneOffice is about embedding smart cognitive applications into process chains and workflows, it’s about learning from mistakes and new experiences along the way. This is the “organization neural system”. Cognitive technologies, advanced analytics and automation help create the capability necessary to operate in digital environments by automating and extracting the data needed real-time to respond to markets, support critical decisions and stay ahead of the game. When we conducted the Digital OneOffice Premier League earlier this year, we focused on the ability of service providers to deliver each fundamental, and the winners were those who scored highest as an aggregate across the five. When we re-run this in the future, the Digital OneOffice framework should be mature enough to evaluate outcomes based on the ability of providers and their clients to create the most effective real-time digital experience, by managing the five fundamentals as one integrated organization unit, where teams function autonomously across front, middle and back office functions and processes to promote real-time data flows and rapid decision making, based on meeting defined outcomes. And front, middle and back offices will cease to exist, as they will be, simply, OneOffice. The HfS London FORA Summit.... we could have packed this out three times over! Have we already passed the singularity? Terrific discussion from the FORA leadership panel featuring (from left to right) Mihir Shukla, Automation Anywhere; Dawn Tiura, SIG; Jesus Mantas, IBM; Cliff Justice, KPMG; Leslie Willcocks, London School of Economics; Mohit Joshi, Infosys and Ahmed Mazhari, Genpact. Hindsight is a terrific practice to follow, if all you really like to do is chew on historical occurrences to learn for the future. However, in the case of Infosys, the only real lesson to be learned from the whole Vishal saga is the firm needs a leader who understands how to grow, divest, acquire and lead a technology services and consulting business. Vishal provided the dreams, the style, technical prowess and the cultural impact... what he failed to deliver was being able to apply these skills effectively to a traditional services business.